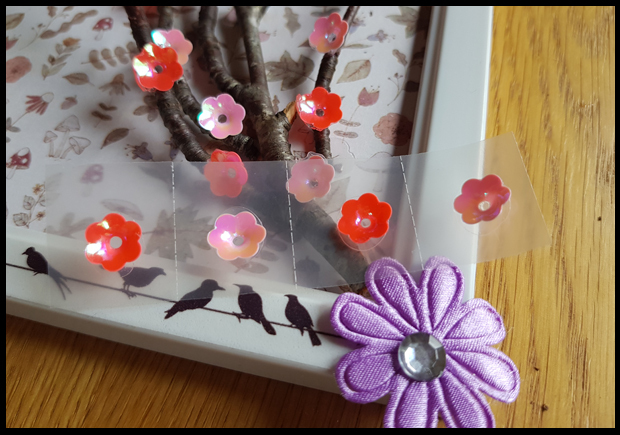 The theme for April's Bostik Blogger challenge is Flowers. 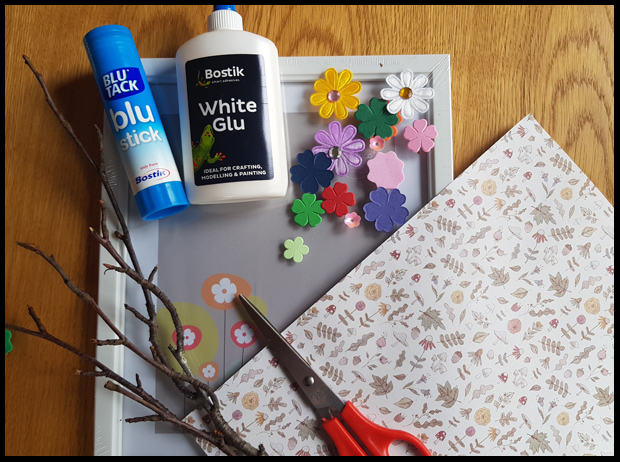 As we were away in the New Forest for Easter, I decided to take our crafting with us and see what inspired us. After having a very cold and wet March which seems to be following us into April, there were not many flowers about yet, some beautiful primrose and daffodils starting to bloom but too early to have fallen petals for us to try out our flower press. Our attention soon turned to the trees, where we noticed that the trees in the forest where starting to blossom and that became our inspiration. * Twigs - one of the best parts of the craft, having a rummage in the woods. This is a great weekend craft, and if the weather is a bit rotten then all the better. I don't know about yours, but my child loves the mud and puddles, so perfect weather to go foraging for the right twigs; and after drying off and warming up an afternoon of hunting for the perfect frame around the charity shops. Day 2 can be the construction of the thrifty flower picture. 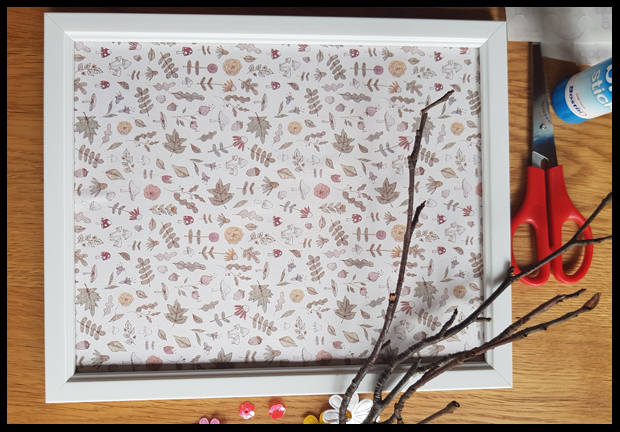 I chose some woodland scrapbook paper for the backing sheet of the frame, stuck on with the Bostik Blu stick. Sticking a twig, which is all twisted and, well not flat, can be a bit tricky. I've used white glue and glue dots to ensure the twig sticks to the backing sheet and for good measure used some washi tape to hold it all in place until the glue has set. Whilst the washi tape was out, we covered the top and bottom of the frame. We had birds feeding outside our lodge so it felt fitting to add these to our frame. The best part and the part that will keep your children busy concentrating for quite some time is the blossom. 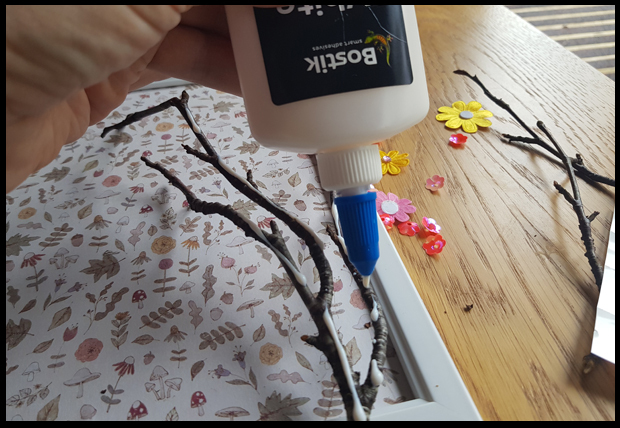 The beautiful flower sequins can be glued to the twigs using Bostik glue dots, they are just the right size and stick extremely well. We loved this weekend craft and found it to be so pretty and a great home decor piece. 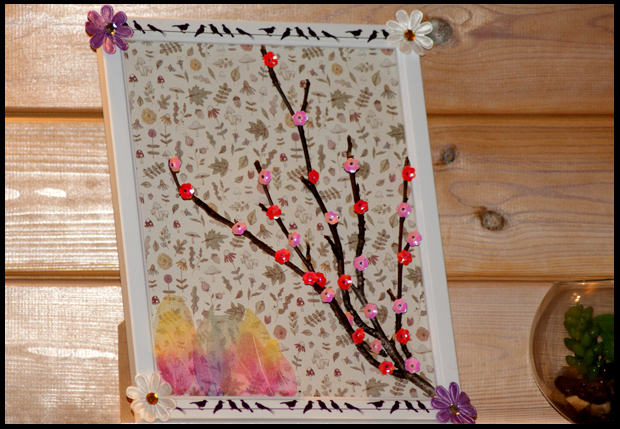 What's even better is the frame and twigs can be sourced from nature and charity shops making this a rather thrifty craft to do with the kids. I like how it reminds me of cherry blossom. My favourite tree. Does anyone else feel that? Disclaimer: I'm part of +Tots100 Bostik Bloggers team. I am sent a selection of craft materials FOC from Craft Merrily to create my projects.